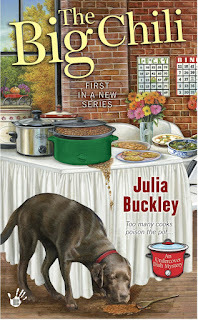 Julia Buckley is the author of the Undercover Dish mysteries and the Writer's Apprentice mysteries. Her twenty-seven years (and counting) of teaching high school English provide endless ideas for characters in her books. In her nearly non-existent spare time she enjoys watching Netflix series, playing Words with Friends, reading good mysteries, photography, and singing along with the radio. Learn more about Julia and her books at her website and the Mysterious Musings blog. 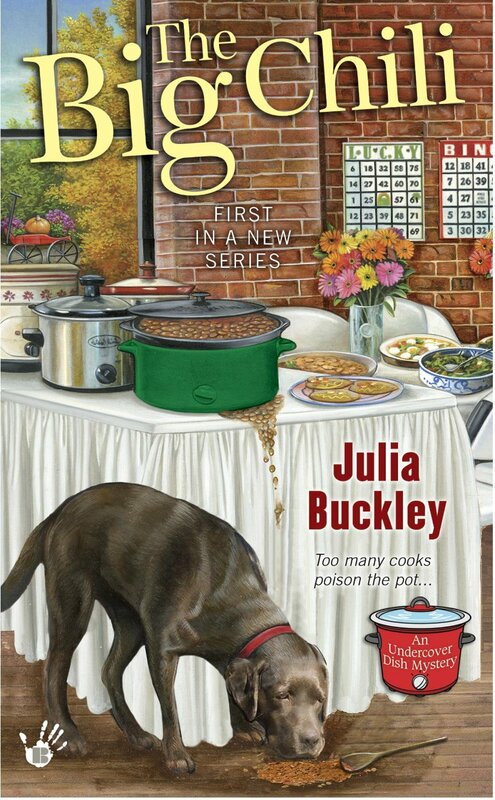 I am very excited to have published The Big Chili this past October. I’m even more excited by the reviews, and I’m hoping I’ll get to continue the story of Lilah Drake for a while. Initially I had written a book about Hungarian food--my Dad is Hungarian, and I grew up eating all sorts of Hungarian delicacies made by my grandmother. As a child, I routinely ate things like Kocsonyas (kah-chawn-yah), which was a dish of pigs’ knuckles preserved in aspic. As an adult, I enjoyed reading culinary mysteries and thought that I could write a good one, so I wrote my tale, set in a Hungarian restaurant in Chicago (alas, something that does not exist), and started querying agents. While I got bites from three agencies, they all said my Hungarian mystery wasn’t cozy enough. One agent—who became my agent—said she liked my writing, but would I consider writing something different? And she suggested the idea of a character who is a brilliant chef, but who sells her covered dishes anonymously to people who want to claim the credit for her creations. I said yes, I thought I could do this, and that was how The Big Chili and The Undercover Dish mysteries came to be. The first book is filled with food that Lilah makes for friends, neighbors, and parishioners, and in the back are a few recipes for readers to try. At one point in the story, Lilah makes a breakfast frittata for her landlord Britt, a wealthy sophisticate who owns an art gallery but isn’t particularly good in the kitchen. Lilah whips up the batter for Britt the night before one of her elegant brunches, and Britt is able to make something delicious for her clients. Lilah’s daily companion is her chocolate Labrador, Mick. I came to like Mick so much in the writing of the stories that when our elderly Beagle passed away last year and the house was empty and sad, I eventually thought about getting my own Mick-like dog. My sons wanted to get a shelter pup, so we settled on a Lab mix that we named Digby. He has a lot in common with the wonderful Mick, who has a very special talent that I won’t reveal here. Meanwhile, here’s a recipe for Lilah’s breakfast frittata. We’re big fans of feta cheese in my family, but you can probably substitute the cheese of your choice. In a frying pan, sauté chopped onion, chopped potato, and chopped red peppers. Add thyme and pepper to taste. Mix until vegetables are desired consistency. Add the eggs to the pan and mix in vegetables; pour into greased baking pan and sprinkle feta over the top of the mixture. Bake for 10-15 minutes until the eggs are completely set, look golden brown, and pull away from the sides of the pan. Friends and family will ask for this delicious option again and again, and the magic of it is that it makes a good breakfast, lunch or dinner! Thanks for hosting me on the blog! Oh my goodness! Digby is a cutie!! And, thanks for the recipe!! !